Kidde is recalling nearly 5 million disposable fire extinguishers because they may not discharge properly, posing a risk of injury. The company said Thursday that it has received 11 reports that the fire extinguishers failed to discharge as expected. No injuries have been reported. Kidde said that a faulty valve component may cause the fire extinguishers to not fully discharge when the lever is repeatedly pressed and released during a fire emergency. Consumers were advised to contact Kidde immediately for a replacement fire extinguisher. The recall includes approximately 4.6 million fire extinguishers in the U.S. and 175,000 in Canada. There are 31 models of Kidde disposable fire extinguishers with Zytel black plastic valves included in the recall. The recalled fire extinguishers are red, white or silver and are either ABC or BC rated. The ratings are located to the right of the nameplate. The fire extinguishers were sold from August 2013 through November 2014. They were sold online and at Home Depot, Menards, Walmart and other department, home and hardware stores across the country. 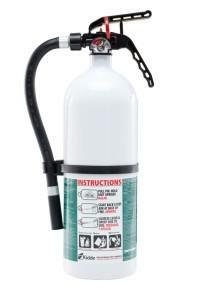 The fire extinguishers priced between $18 and $65, and about $200 for model XL 5MR. Model numbers involved in the recall include 10BC, 1A 10BC, 1A 10BCW, 2A10BC, 5BC, 5BCW, FA10G, FA110, FA5B, FC10, FC110, FC5, FH/ RESSP, FX10, FX10BC, FX10K, FX210, FX210R, FX210W, FX340GW, FX340SC, FX5II, KFH Twin, M110 Twin, M5 Twin, Mariner 10, Mariner 110, Mariner 5, Mariner 5 G, RESSP and XL 5MR. Model numbers can be found on a nameplate on the front of the fire extinguisher. Kidde can be reached toll-free at (855) 283-7991 FREE from 8 a.m. to 5 p.m. ET Monday through Friday, or online at www.kidde.com and click on Product Safety Notice for more information.